From semi-automatics to sub machine guns, the 9mm has long since established itself as the preeminent round for law enforcement and counterterrorism units across the country. 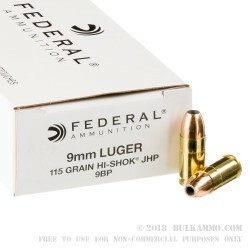 The Federal 115gr Jacketed Hollow Point Hydra Shok is world renowned for its performance and lethality, and is the ideal round for lawmen and military officers serving their country today. The Federal 115gr JHP Hydra Shok originally received its name due to the hydrostatic shock effect that bullets have on the body upon impact and formation of the temporal cavity. Although the effect is more greatly pronounced with rifle rounds, the faster the bullets velocity, the greater the elastic effects of hydro static shock within the body. 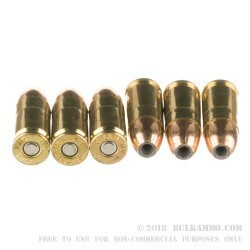 The 115gr grain copper jacketed rounds are designed to expand upon impact with the body, and with bullet weight retention significantly increased due to the copper jacket that encompasses the entirety of the swaged lead core. Muzzle velocities average near 1,200 feet per second, and transfer an astounding 360 foot lbs of force upon impact. Perfect for subsonic applications, The Federal 115 grain 9mm JHP Hydra Shok is a round that consistently delivers, and will never leave you wanting for more. Review by Billy K from Pa. 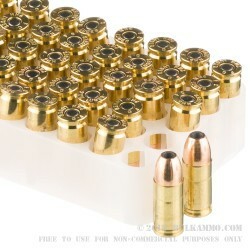 I really like this ammo and was pleased to get it at such a good price. Q: What is the velocity of this round? A: Hello Eric, Federal lists the muzzle velocity of this round at 1,180 fps.